(Last Updated : 24.12.2014). HSTSB has invited Online applications for direct recruitment to 7036 Posts of PGT‐Lecturer H.E.S.‐II (Group‐B Services) through the website of C-DAC, Mohali i.e. www.recruitment-portal.in The online application can be filled up from 05th September, 2014 upto 26th September, 2014 till 5.00 p.m. thereafter website link will be disabled. The candidates are strongly advised to apply online well in time without waiting for last date of submission of online application. The printed copy of the online form with necessary certification will be brought at the time of interview/ verification. Update : HSTSB has uploaded Fee Confirmation List for various posts of PGT Lecture under (Advt. No. 1/2014 & 2/2014). The candidate whose name is not in the list shown below are requested to either Fax the fee deposite proof on 0172-6619003 or Send mail at Tech.cdac@gmail.com or Contact personally with Fee deposite Proof at CDAC office (A-34, Phase VIII, Industrial Area, Mohali) before and on 12/12/2014 upto 3 pm. See the lists given below. 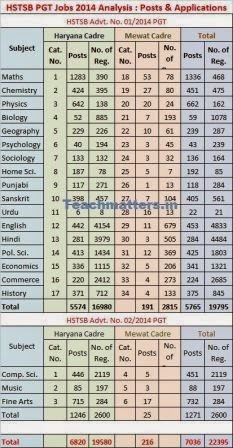 Certificate of having qualified Haryana Teacher Eligibility Test (HTET)/School Teachers Eligibility Test (STET) of respective subject for the post applied, conducted by Board of School Education Haryana, Bhiwani/One Time exemption of HTET/B.Ed (See Note-1). For teachers upper age relaxation (See Note-2). For full details click the following links to download/see the original advt.